For manufacturers and resellers alike, today’s challenge is to integrate high-end videoconferencing solutions with remote end points that may in a hotel or home office. claimed, videoconferencing has, in effect, reinvented itself. The new videoconferencing is ‘telepresence’. Those new technologies have enabled telepresence to become— well, virtually a reality. 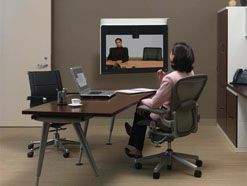 And even if telepresence is more than many end users want, those same technologies are combining to make ‘plain vanilla’ videoconferencing more reliable, more flexible, and more affordable. Some of these technologies are much more visible than others. Take high definition screens, on the one hand, and codecs on the other, for example. They are opposite ends of the visibility spectrum, yet each is equally essential to the new conferencing experience. Fumihiko Kawamura, Sony’s Product Marketing Manager for IPELA visual communication systems, is clear about the role of the latter in enabling delivery of the former. “If we can create better compression technology, we can deliver more information with the same bandwidth,” he says, citing Sony’s PCS-XG80 personal HD resolution videoconferencing unit as an example of the capabilities of superior codec technology. The need for interoperability is, inevitably, leading to increasing collaboration between vendors: Nutley points out that his company is working with Microsoft to develop an HD webcam, and with Barco on a telecollaboration solution. After years of operating in relative isolation, videoconferencing systems now integrate better with other AV technologies such as room control platforms. and of telepresence, it’s easy to forget that not all potential end users can hope to achieve this state of conferencing nirvana in the near future. Aethra’s CEO Marco Viezzoli sounds an appropriately cautionary note. Mark Child agrees. “There is a lot of buzz right now surrounding telepresence and its ability to provide a truly “immersive” conferencing experience,” he says. “The technology is quite exciting but the cost is out of reach for all but the largest enterprises.” LifeSize’s Ray Kenny might disagree, however, pointing to his company’s ‘Express’ telepresence product with a price below US$5,000. And despite Viezzoli’s wise words, there can be little doubt that what the industry mostly wants to talk about right now is telepresence. As a term, it has gained an almost magical significance with its goal of making conference participants feel as if they are all in the same room. So it’s important to remember that telepresence is, in fact, little more than the coming together of a number of technologies. HD video, high-quality audio and the networks capable of supporting them are designed to make faces and voices more lifelike, capturing the subtleties and nuances in communication that are taken for granted when people are together in the same location. Significantly, and regardless of how affordable or practicable it is, telepresence is capturing the attention of end users, and doing much to reposition the general perception of videoconferencing. It is, in effect, pulling new customers into the market, even if what those customers ultimately buy is not a telepresence solution. Ray McGroarty, Solutions Marketing Director at Polycom EMEA, summarizes what he believes those customers are finding. “New technologies have changed the face of conferencing by offering flexibility, high quality, and total integration,” he says. “Nowadays people can attend the meeting by whichever method they have available at the time, whether it is just their mobile phone, or their telepresence suite. You don’t have to have video to attend the videoconference. We can now mix different classes of users into the same meeting. And even if you miss the meeting, we can record it so that it’s viewable later. If success for an industry is a function of delivering what customers want, then the videoconferencing business seems set to continue on its exciting upward trajectory.